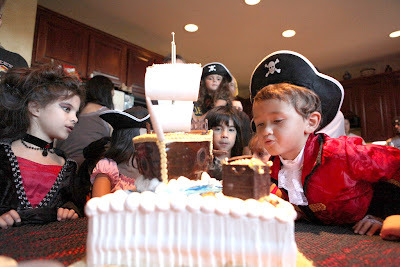 Home » Awesome Birthday Parties » Ahoy, Pirates! 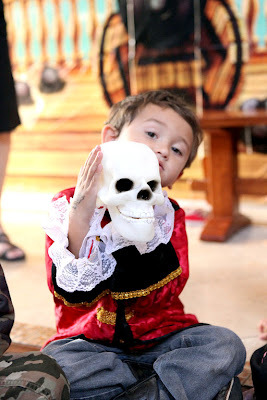 I think having a Halloween birthday is pretty cool…the variety of themes is endless; it seems like everyone is in a festive, fun mood and up for almost anything; and there is usually a lot of theme-oriented stuff available to help put together an awesome birthday party. 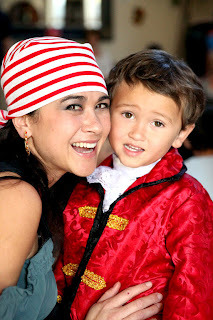 So when our Halloween Baby, Isaac, requested (or rather, demanded with an “arrrgghhhhh”) a Pirate Party, I said “YESSSS” without hesitation….because I knew it would be an easy party to plan. 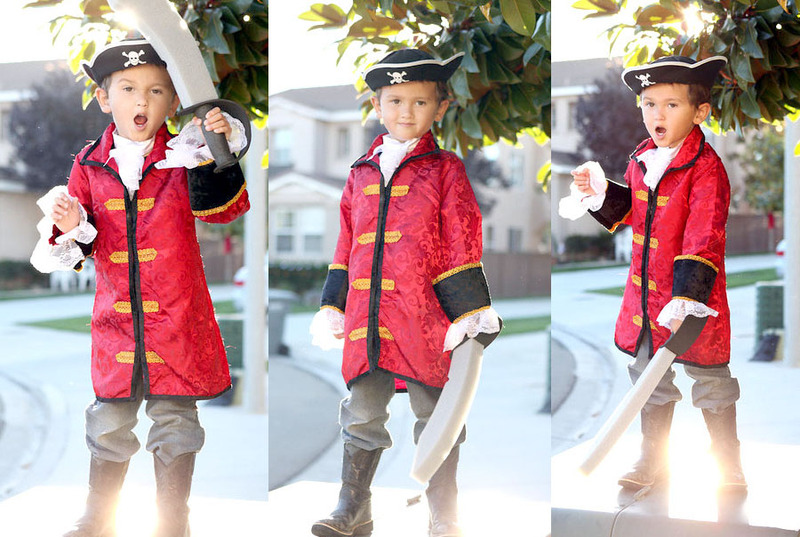 Around Halloween, pirate stuff is everywhere! 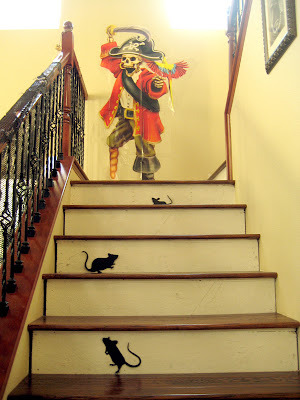 And since my sisters and I had already done an amazing pirate party for my (now 13 year old) nephew about 7 years ago, I knew there were plenty of ideas I could reuse. The Birthday Boy, practicing his “arrgghhhhhh and eyepatch”. 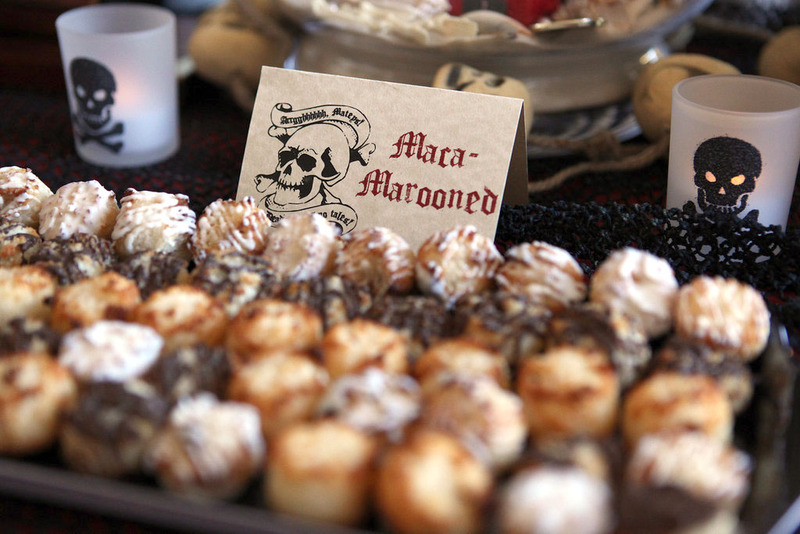 Before I get into the details, I must admit (or maybe the word should be “boast”) that this party was completely planned and pulled together in just a little over TWO WEEKS….so far, our quickest, most last minute, yet still smashingly successful, party to date! Everything turned out better than I had imagined. And I thought the Indiana Jones party was last minute! Seriously, I have to give myself and my party Dream Team a huge pat on the back. Most everything (decorating, shopping, food prep, game/activity planning) was done just one or two days before the party! 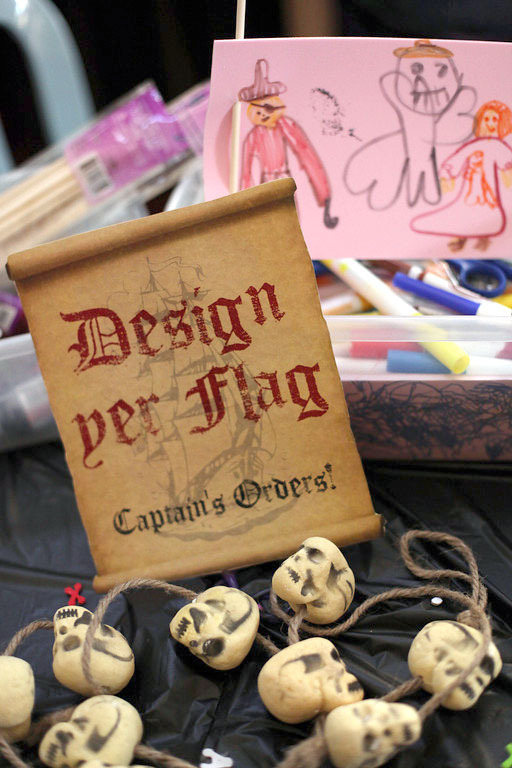 The only things that were done in the two weeks before were the invitations and ordering party supplies from Oriental Trading Company and Rhode Island Novelty. All photos (except for the invitations and some of the decorations pics) are UNEDITED photos taken by my sister, Julie, of Lot116 Photography. 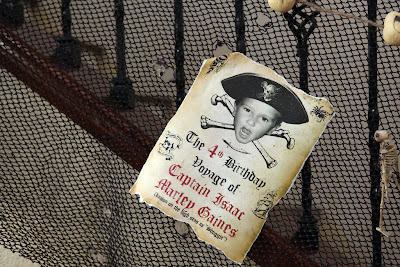 INVITATIONS: The invitations went out about two weeks before the party and were thrown together in about a day! As usual, I had lots of work deadlines that kept me too busy to even get into party planning mode (wedding season is year-round for me these days and I always have painting projects). So late one night after finishing up a bunch of work, I realized we were only a couple of weeks away from Isaac’s birthday, so it was crunch time! 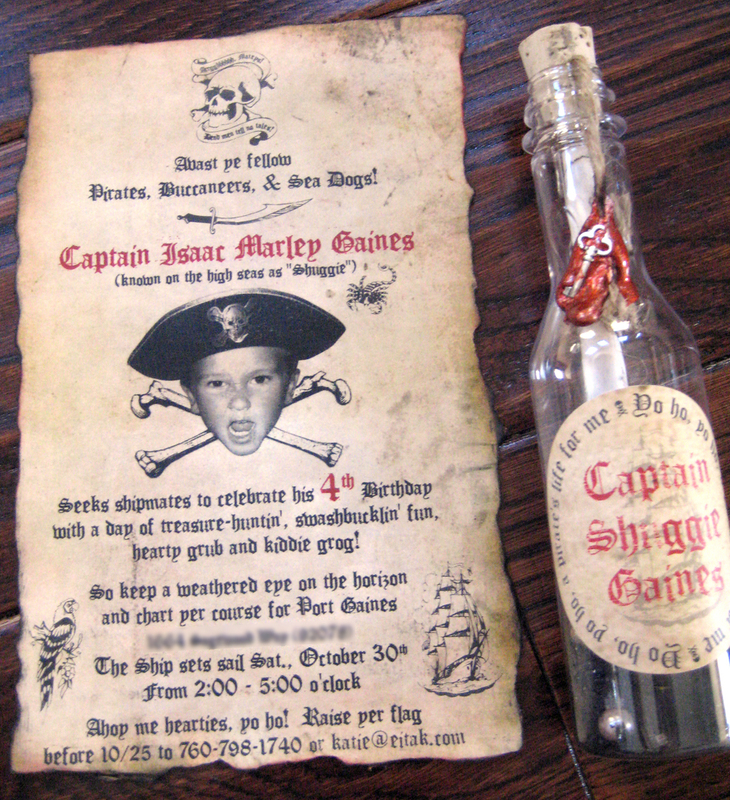 I already had the perfect invitation format from my nephew’s party (which I had since re-done for several other themes for clients’ events)…..the Message in the Bottle. I know, this concept for an invitation is nothing new. These days, you can get invitation kits from Oriental Trading Company, complete with sand, shells, bottle, cork, labels, scroll. 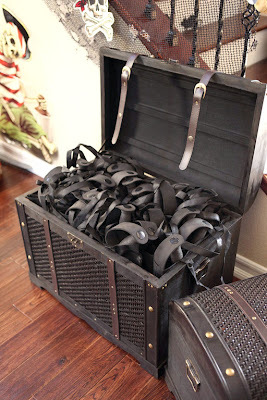 Martha Stewart has a version with glass bottles and mailing boxes. But in a pinch, I knew they would still work and carry the theme…and I could get creative with the design. I already had the plastic bottles, sand, shells, jewels from another job….so all I had to do was print the labels/scrolls, put them together and pop them in the mail. Yes, the plastic bottles are mailable as is! You just have to stick the appropriate postage onto the bottle and make sure to tape the cork securely. 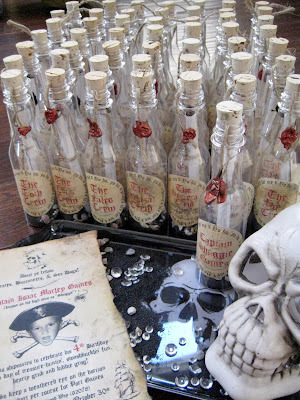 Knowing that I was going to go this route with the invitations, I went ahead and had my niece, Maylie, and my sister, Mary, fill all the bottles while I was at a painting job (Mary was already a pro from putting together Tyan’s invites). Then, all I had to do was design/print the scrolls (which I printed on some Ecru parchment paper I already had), tie with a pull string, put in the cork, add the label, and mail. All in a day’s work! I think they are pretty fabulous! My favorite part is that everyone thought I had burnt the edges. Nope! 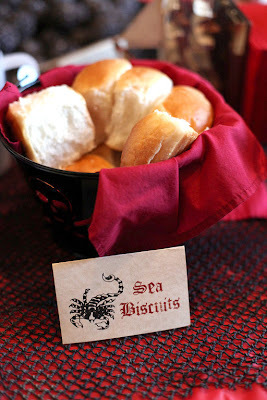 Here’s my secret trick….my husband and I tore all the edges of each scroll, and then I used brown and black ink stamping pads and rubbed them over the torn edges (like a sponged faux finish) to replicate the look of burnt paper. Fooled everyone…and it was less messy/smelly and no smoke or fire hazard! For the ones that were hand-delivered, I did painstakingly melt wax and stamp to give the bottles the look of a captain’s official seal. And I did spend a lot of time online researching Pirate lingo for the wording (that was kinda fun). DECORATIONS: A pirate theme, around Halloween, HAS to be the EASIEST party to decorate for. 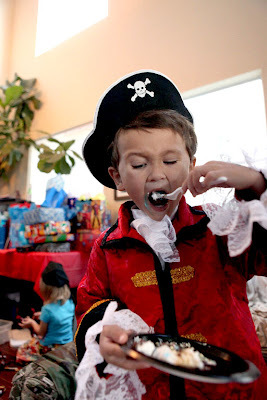 Unlike our other party themes (where we have to get really creative and make or print a lot of the decorations), pirate stuff is EVERYWHERE: Dollar Tree, 99¢ Only Stores, Walmart, Target, Spirit Halloween Stores. 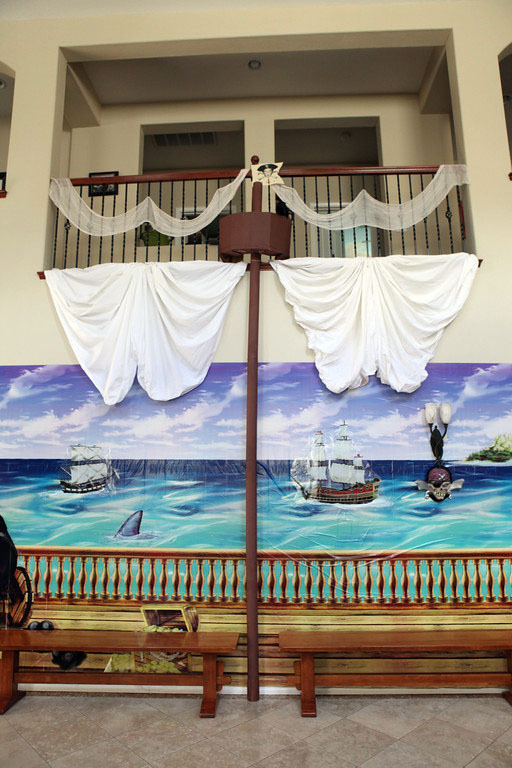 I decided to transform our living room into the deck of a ship….so I cheated and ordered a Design A Room scene from Oriental Trading Company. 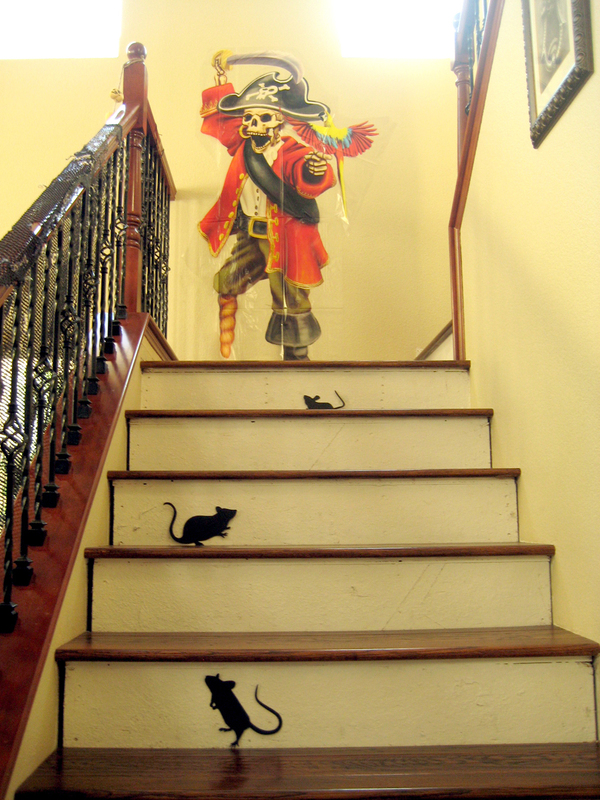 The night before the party, with the help of my husband, mom and dad in-law, we cut out all the vinyl pieces and decorated! 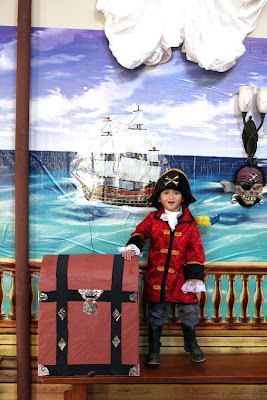 Check out the caption of each picture for details on how we decorated…. 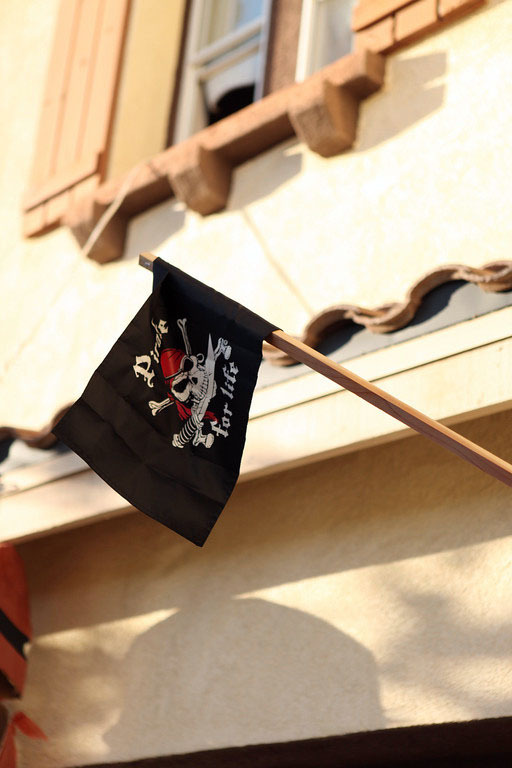 “Pirate for Life” flag brought by Nana and Papa greeted the wee Pirates. 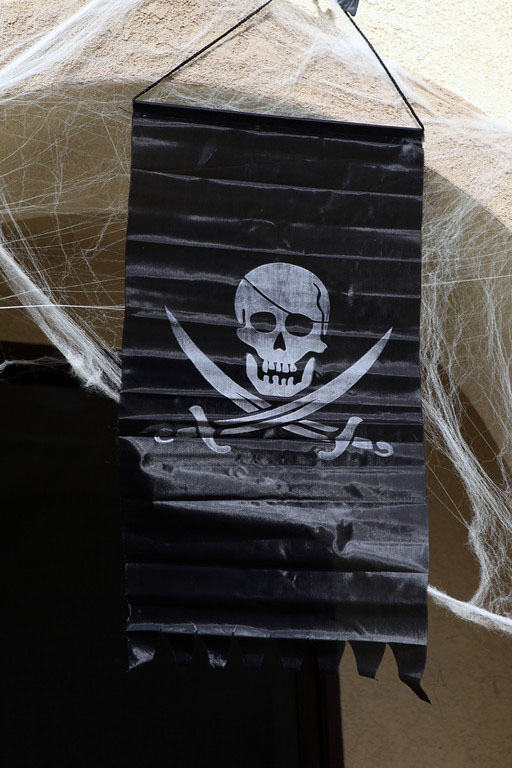 This Jolly Roger flag from Dollar Tree worked great out front with the Halloween cobwebs. One of the cutouts from the Design A Room kit. The kit is fantastic, comes with all sorts of pirate-themed details: skeleton pirates, cannons, treasure chests, parrots, ships, barrels, etc. All you need are scissors/ double-stick tape and you’re done! 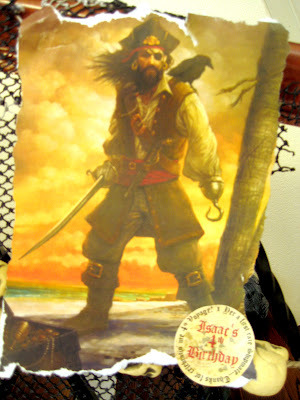 Found some cool pirate artwork to print. 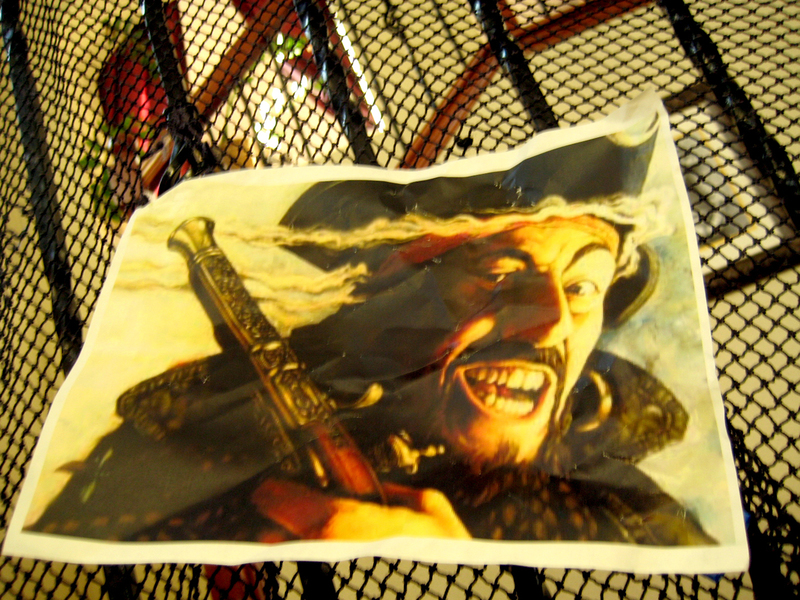 Our friend, Makala, placed the printouts around the house. 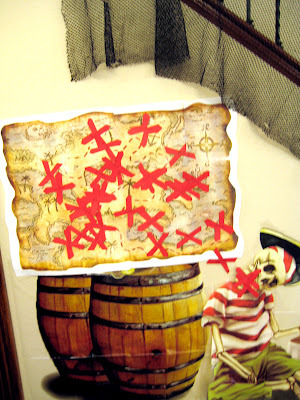 Some more of the cut outs…this picture was taken by me after the party, so it shows the treasure map game with all the kids’ X’s. The ship’s mast was fashioned by my husband out of four cardboard mailing tubes, taped together with duct tape and spray painted brown. 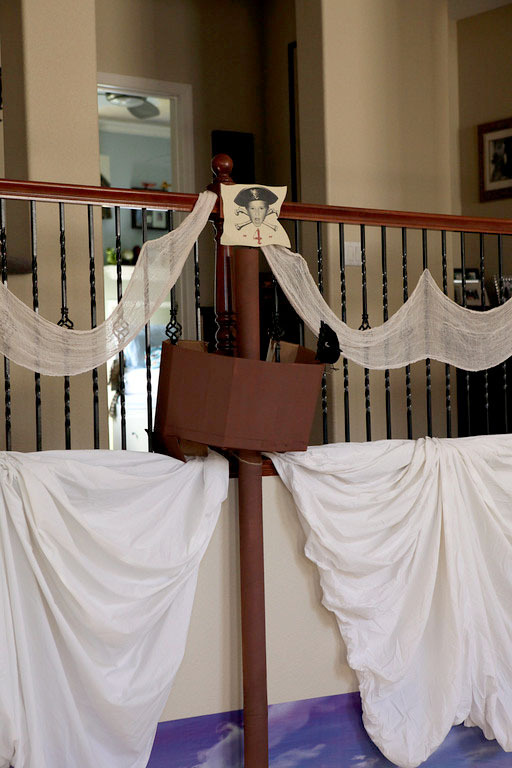 The middle post of our upstairs banister was a perfect place for the mast and crow’s nest. 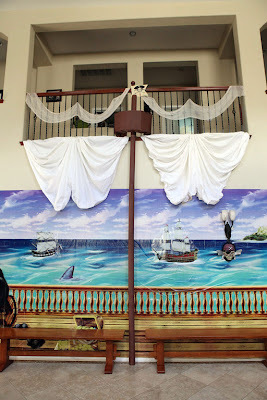 For sails, I used white fitted sheets and gauzy cheesecloth. My husband fabricated the Crow’s Nest out of cardboard and duct tape, spray painted brown…I added a printed paper flag and a black crow. 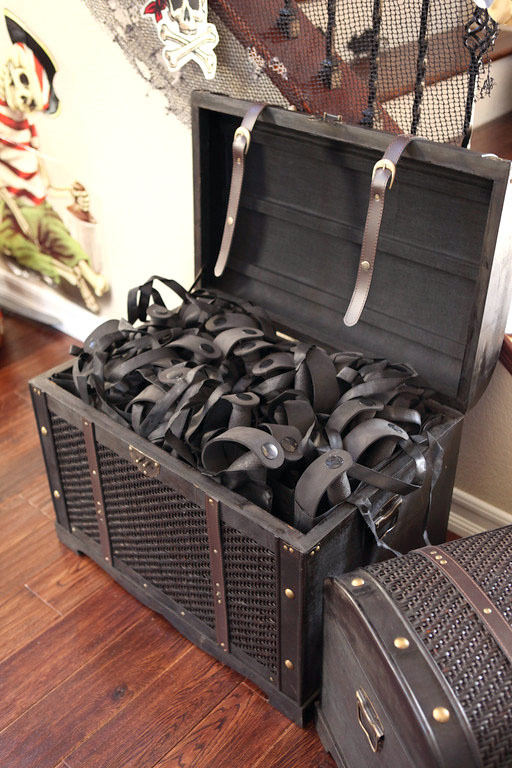 The boys’ costume trunks, used as “treasure chests” for goodie bags and game prizes, added to the room decor. 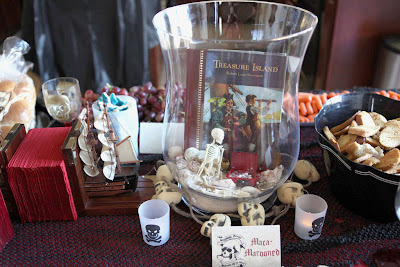 I created a centerpiece using a glass hurricane vase, leftover sand, shells and gems from invites, plastic gold coins, some of Mason’s skeleton and toy pirate ship accessories, and LED tealights. 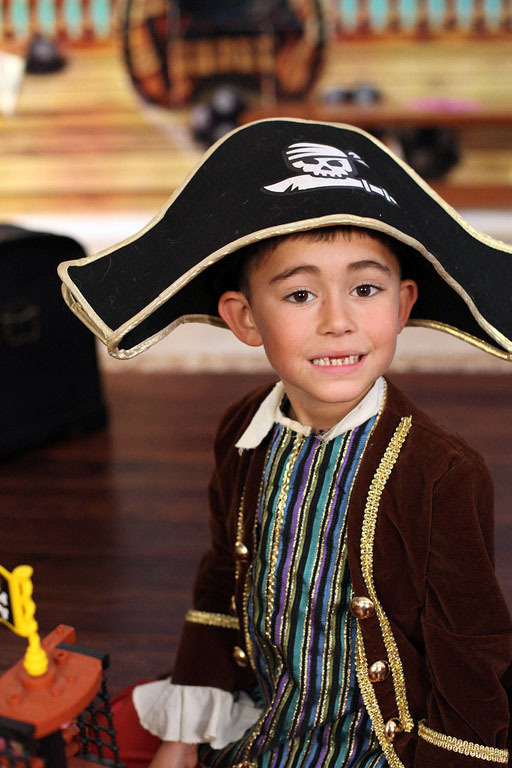 The ship bookends from Mason’s room served as napkin holders. For the table, I used fisherman’s netting as a runner over a red plastic tablecloth. 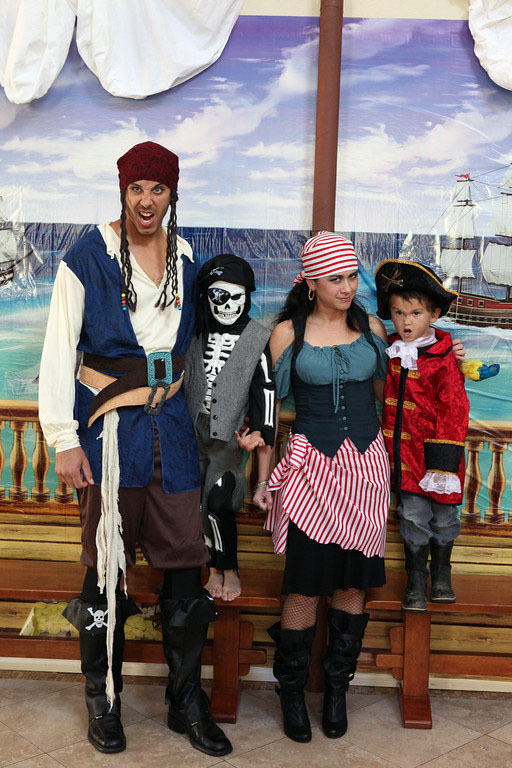 A family of Pirates…getting into character helps us become part of the decorations. 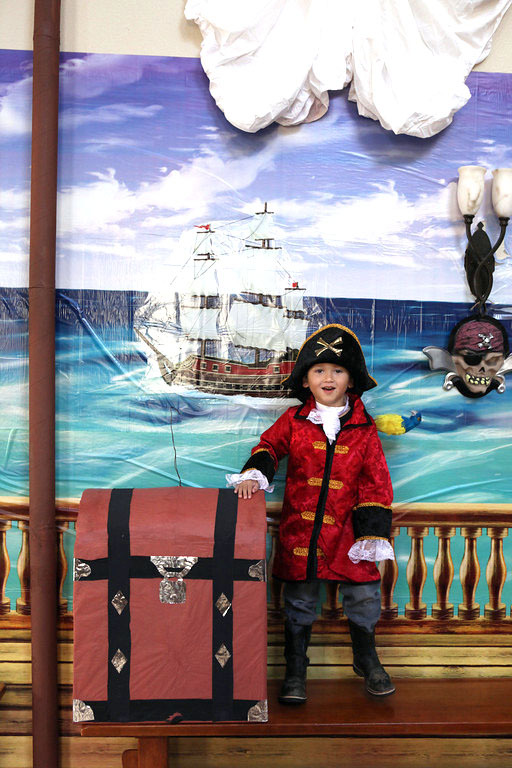 Isaac in his Pirate Captain outfit (found at TJ Maxx), in front of the Design A Room scene, with his treasure chest piñata…also shown: pirate skeleton decoration from the 99 cents store and our homemade mast. 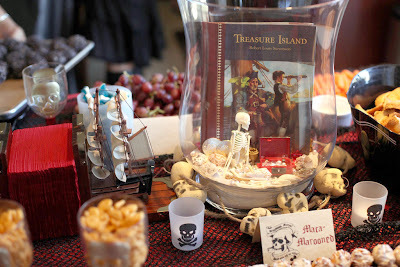 My sister, Julie, found a bunch of really cool, black skull/crossbone platters, buckets, bowls at Ross. This bucket is actually a luminaria (has a spot for a candle or tealight at the bottom). 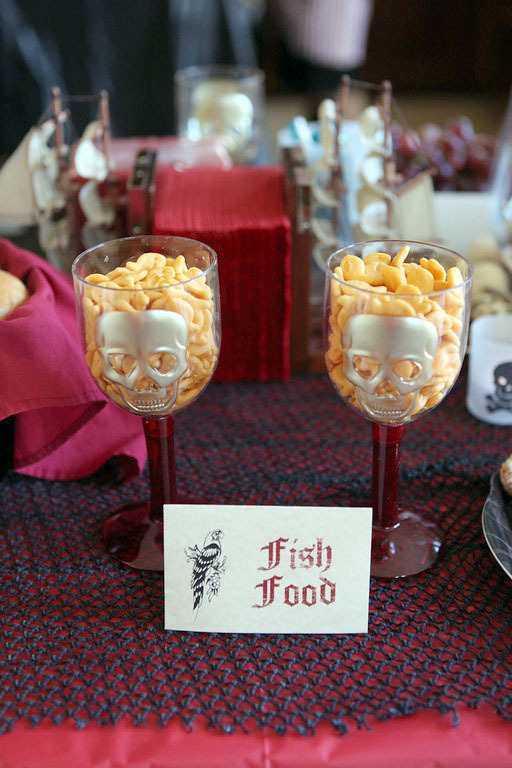 Glittery black skull votives from 99 Cents Store. Skeleton cups from Dollar tree. 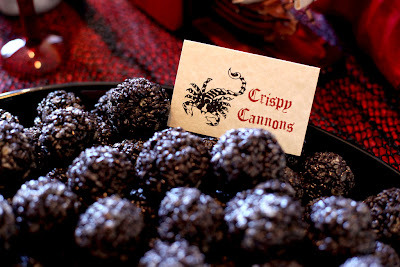 My friend, Allison, made all the cannonball-shaped Rice Krispie treats, using black food coloring. 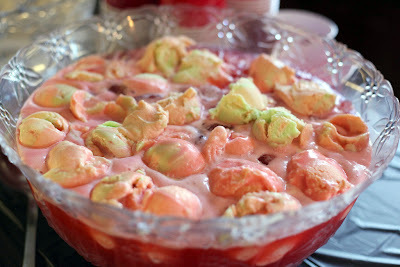 My sister, Julie, suggested this easy punch (Hawaiian Punch, Sprite, Rainbow Sherbet). 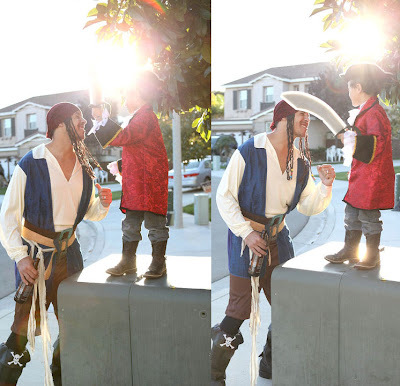 I hadn’t made it before….luckily, my friend Tina had and threw it together for me….it was hit! THE CAKE: I can’t even begin to describe how AMAZING this cake was. 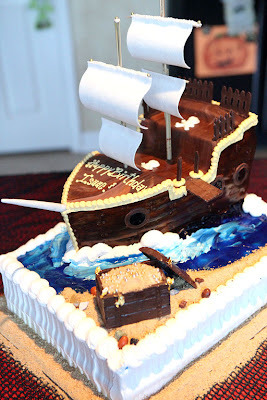 It was so beautiful, detailed, and perfect…that it broke my heart to have to cut into it! 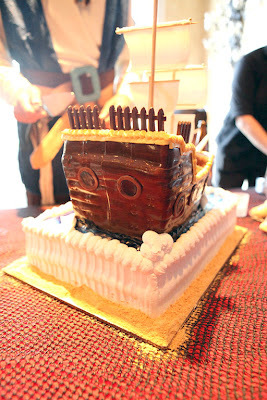 Once again, our dear friend Jeff of Rhino Cake Co., outdid himself! When we asked Isaac what he wanted for his cake, he mentioned three things: “Pirate ship, coconut, chocolate.” Uh-oh…I’m not sure if there are a lot of coconut fans out there, but it’s what he asked for. So, we just let Jeff “run with it” and his masterpiece was UNBELIEVABLE! 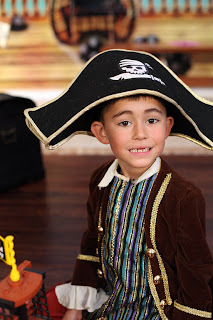 He made a completely edible pirate ship, complete with mast, sails, woodboard planks (and nail holes), portholes, a “walk the plank” and gold-leaf treasure chest filled with pearls. If only you could see the detail in the pictures. It’s truly a work of art! And it was the most delicious cake I have ever tasted: moist chocolate cake with layers of light cream filling flavored with coconut, as well as dark chocolate truffle filling. I had four pieces after the party and one for breakfast the next day. 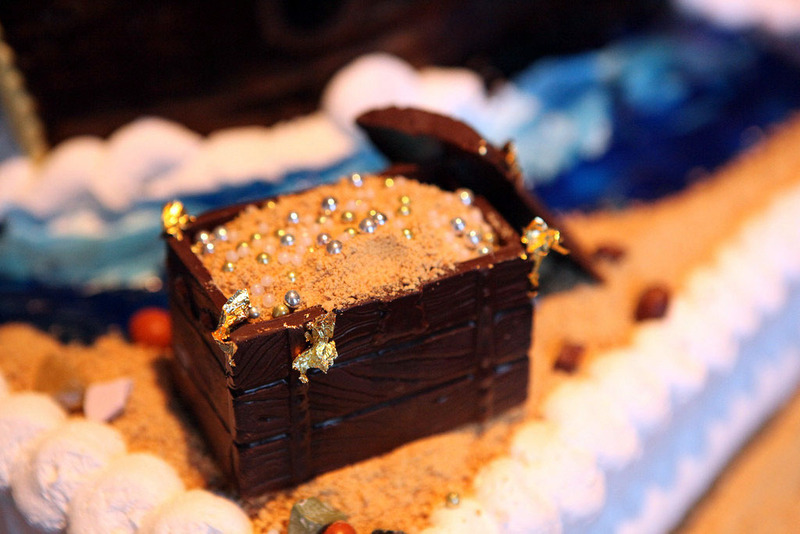 Chocolate treasure chest with edible gold leaf, sand and pearls. Blowing out his birthday candles! FOUR! ACTIVITIES/GAMES: I literally planned all the games the night before. 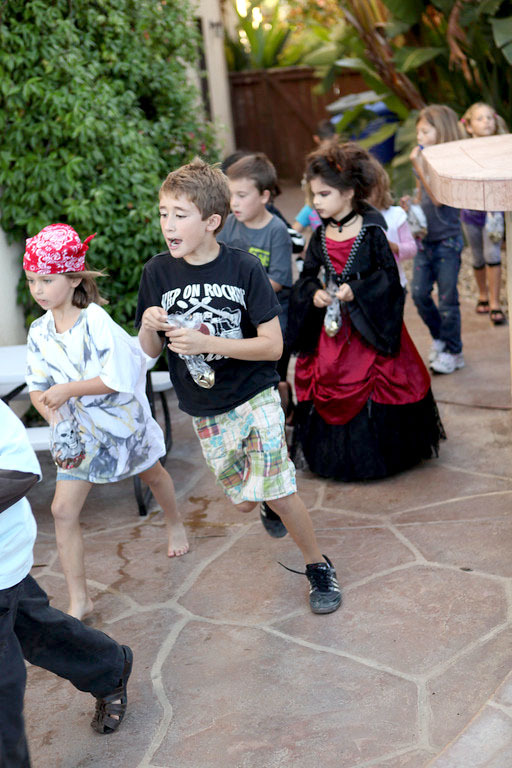 A lot of them are just themed versions of our standard party games…perfect for the age group of kids at the party. Here’s what we did….. Wooden dowels, hole punches, cardstock, markers, glitter pens and stickers for kids to create their own Pirate Flag. 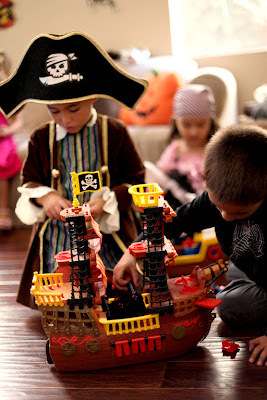 Pirate ship toys for the kids to play with. “X” Marks the Spot game (like Pin the Tail). 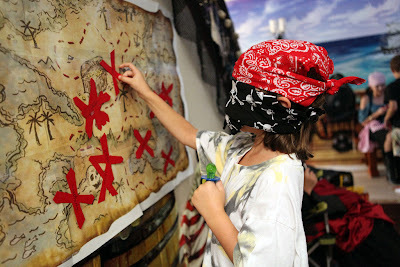 I printed out a Pirate’s Treasure Map that I had found online. “Sharks in the water” for the Walk the Plank game. I bent/stapled pieces of gray cardstock and cut into a fin shape. The water is a blue sheet. 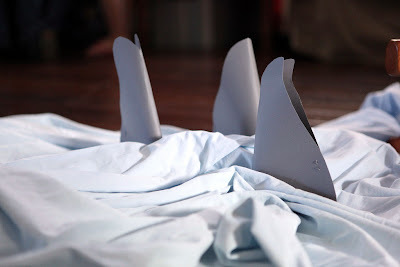 The fins are taped onto the sheet and positioned between/below the two planks (our kitchen benches) that the kids had to jump over. 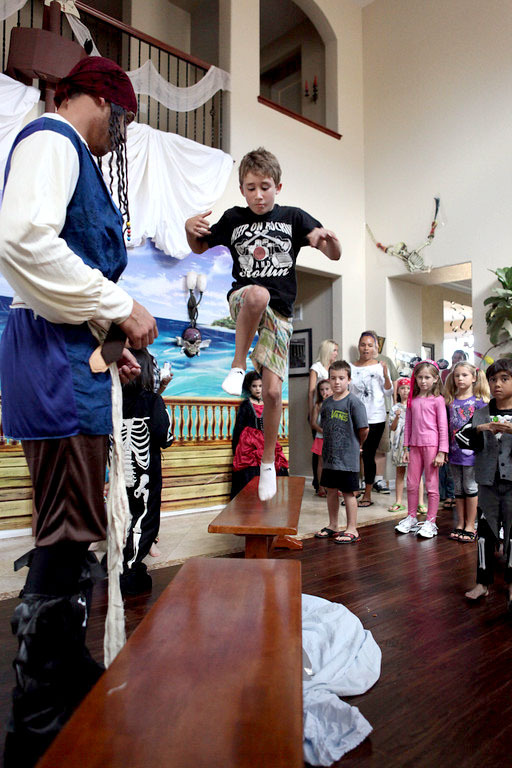 Pirate PJ takes a stylish leap. 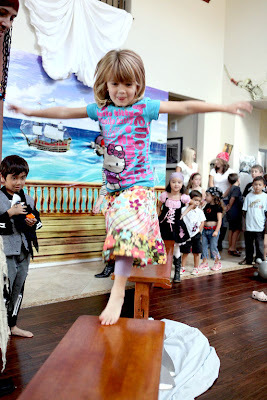 “Walk the Plank”…my husband was there to supervise, but most of the kids “sailed” through this activity. 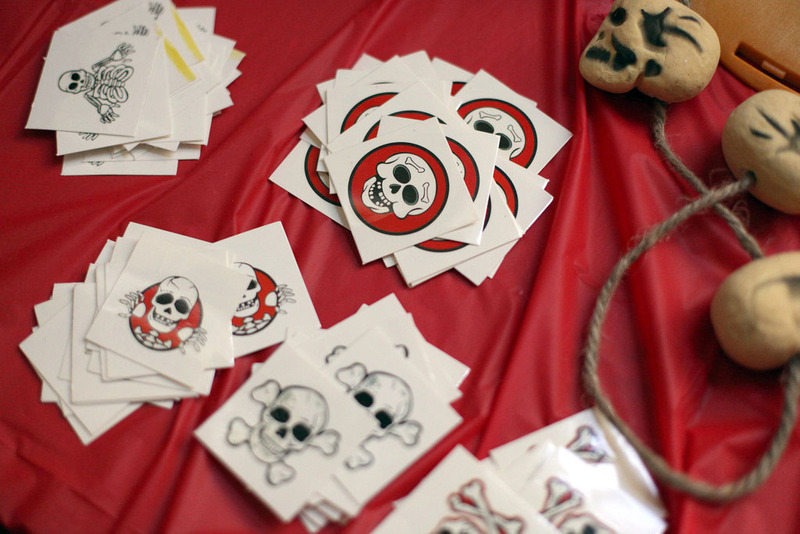 Tattoo station…real Pirates have tattoos, right? 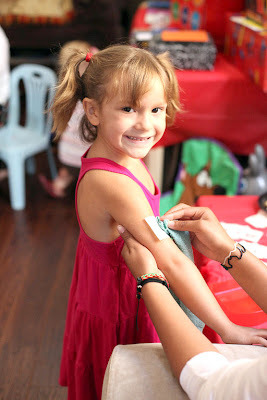 Our pal, Tori, gets a tattoo. Pass the skull (hot potato game)…Cash (on the right) is ready! He’s only 3, but already a pro! 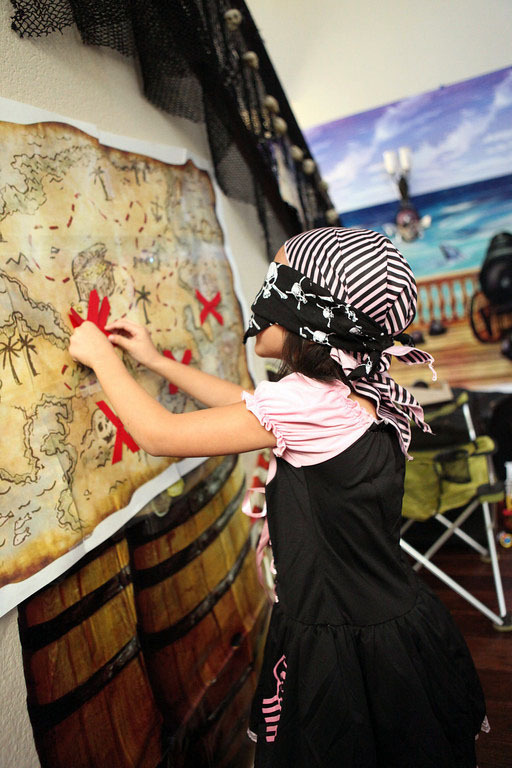 “Treasure Hunt” – Originally, I wanted to do a scavenger/treasure hunt with illustrated map…but wasn’t sure if some of the younger guests could participate. Plus, with over 30 kids, it would have been a little crazy to organize teams. 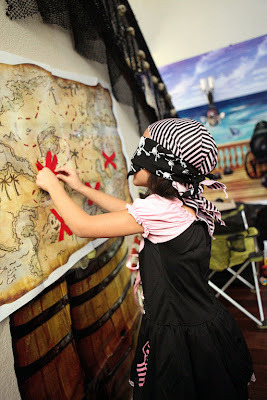 AND it rained that morning, so I thought we might have to nix the whole treasure hunt idea. 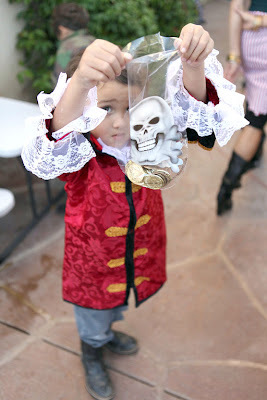 Luckily, the sun came out and the backyard dried up enough to do the treasure hunt. So I borrowed my friend Irene’s idea from her son’s Toy Story party where she had scattered green army men around the yard and had a free-for-all hunt. I used gold coins, plastic pirate figurines and plastic gems. 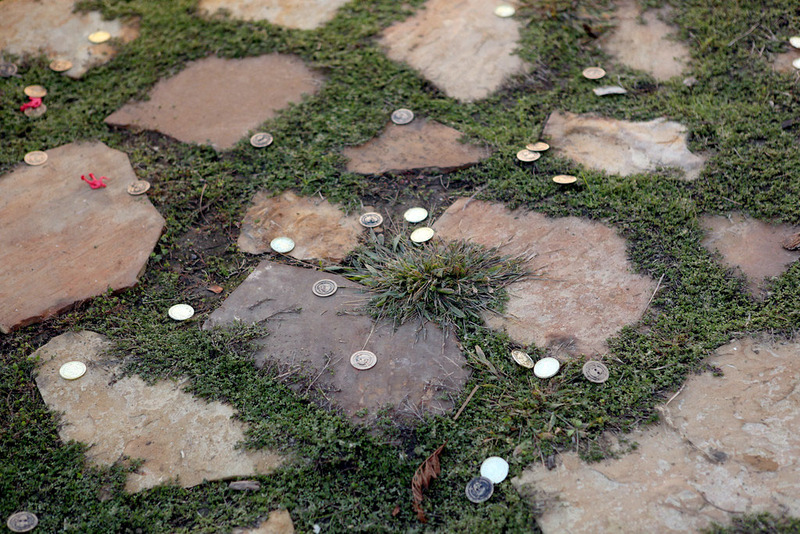 While the kids were occupied with another game, my bro-in-law, Mark, scattered and hid everything around the yard. 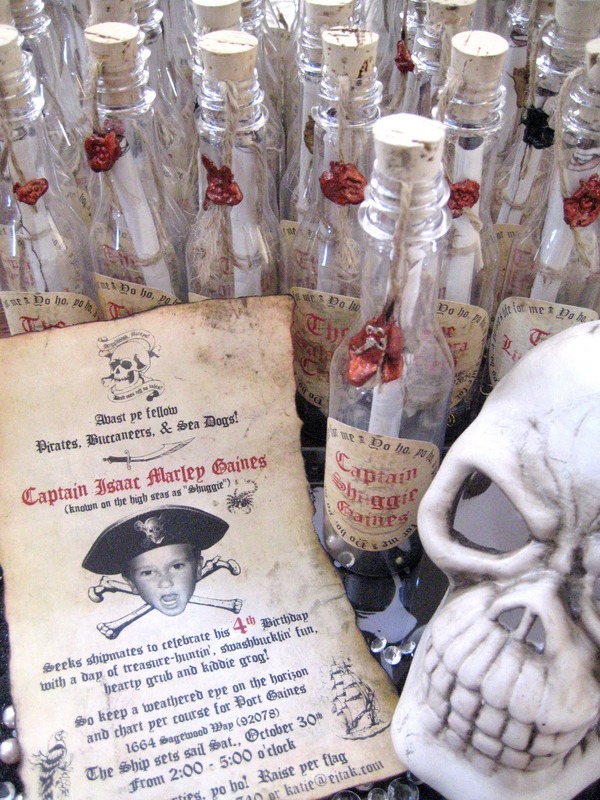 I printed little scrolls that said “Arrgghhhh, you’ve found me treasure!” and put them into some of the extra plastic bottles I had. 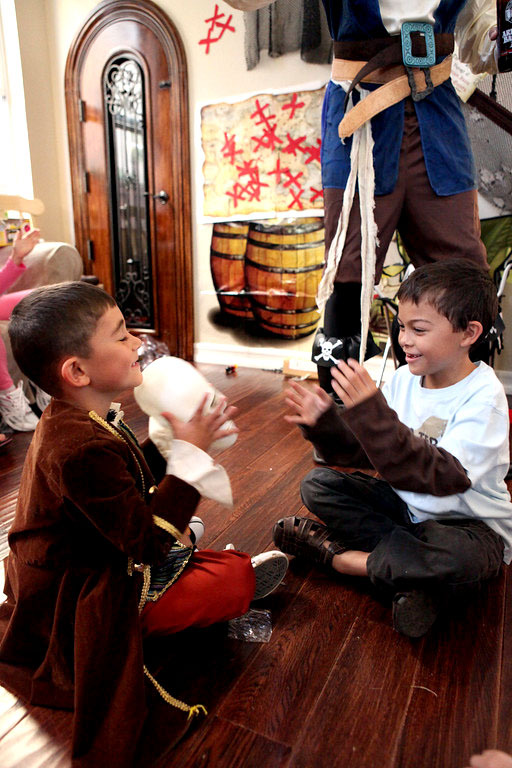 Kids who found these got to pick a prize from the treasure chest. Treat bags from Dollar Tree were used to hold loot. 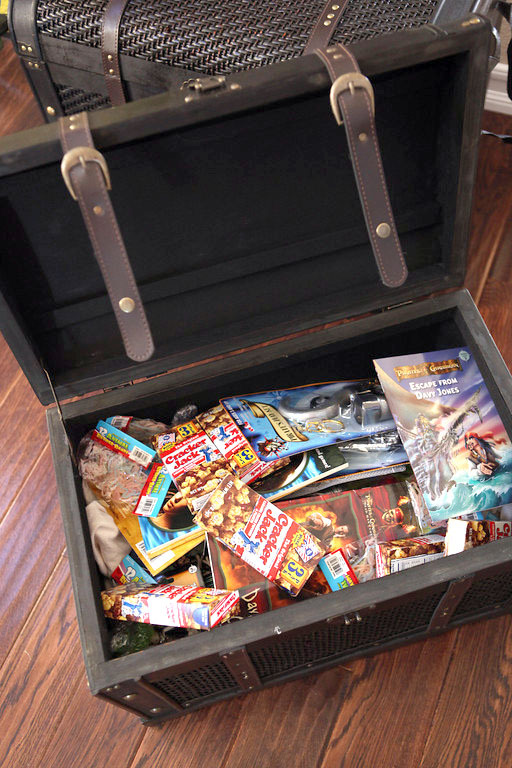 The Treasure Chest for the game winners to choose from….filled with pirate-themed booty from Dollar Tree, 99 Cents Store and Rhode Island Novelty. 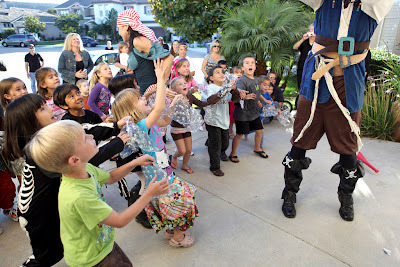 Getting to the Pirate’s Booty! CANDY!!!! Isn’t this picture so cool! 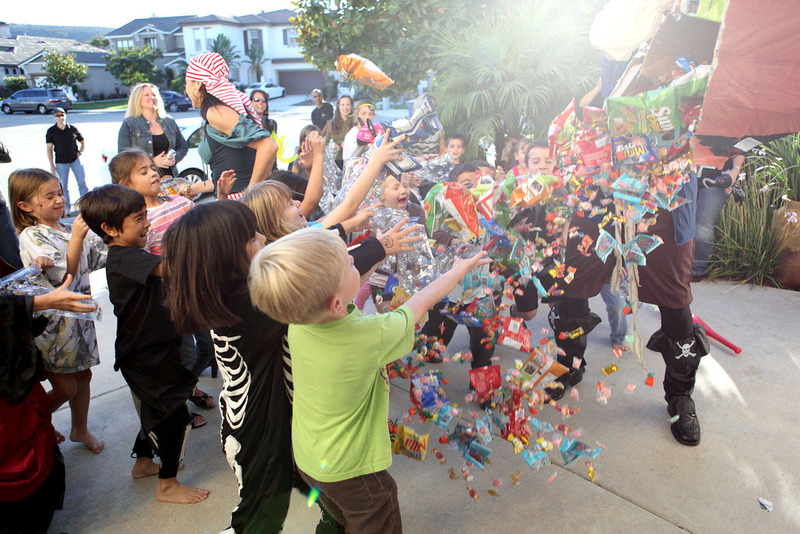 Julie captured the moment before any candy had hit the ground…AMAZING! 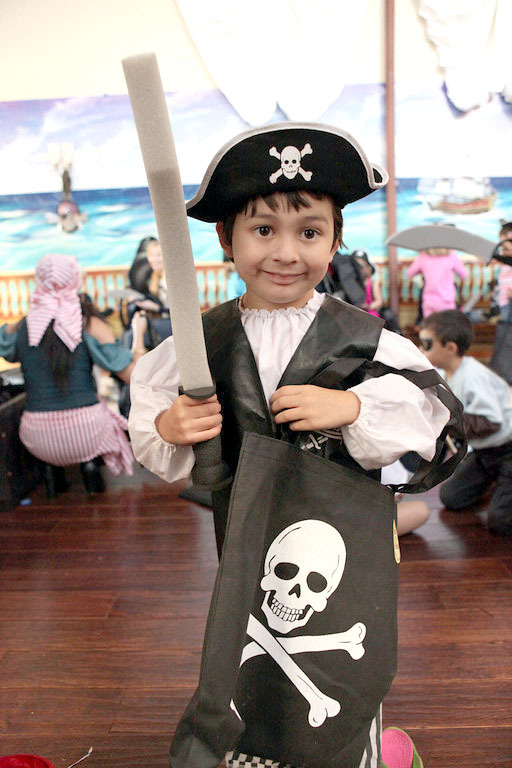 THANK YOUS: The goodie bags were pretty straightforward…the only thing I made were thank you stickers that said “Isaac’s 4th Birthday, Yer a First Rate Ship Mate! Thanks fer celebratin’ my 4th voyage with me!” Everything was purchased from Oriental Trading Company, Rhode Island Novelty, 99 Cents Only Store, Dollar Tree and Target. The Jolly Roger print totes were perfect for Halloween trick-or-treat bags (the party was the day before) and filled with a skeleton keychain, a small plastic telescope, eyepatch, pirate hat or bandana, and foam sword. My sisters and scoured all the Target $1 sections for the foam swords….between the three of us, we had Targets in Temecula and all of San Diego covered! 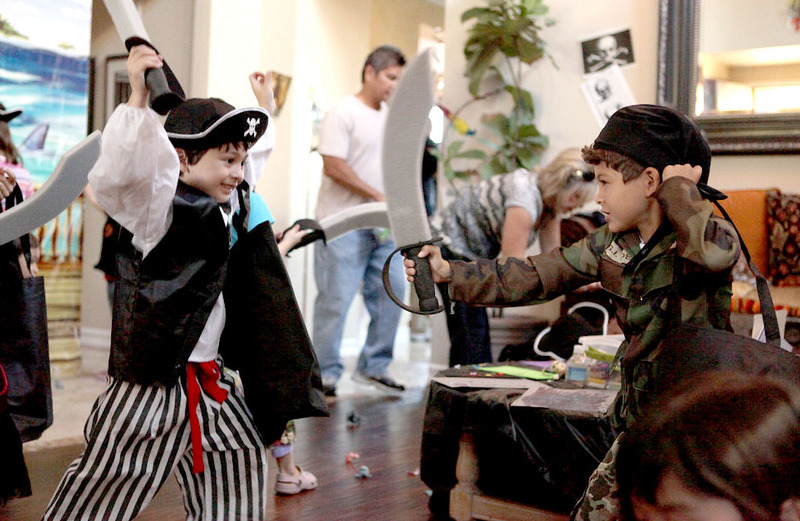 The foam swords were a hit. The thank yous are still in the works, I’m almost finished. I’m using the pirate map from the X marks the spot game….here’s a digital proof. 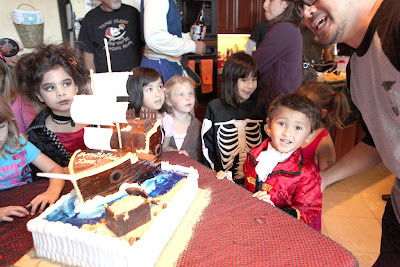 My shipmates came aboard to celebrate with me. Played daring games, ate grub and drank. 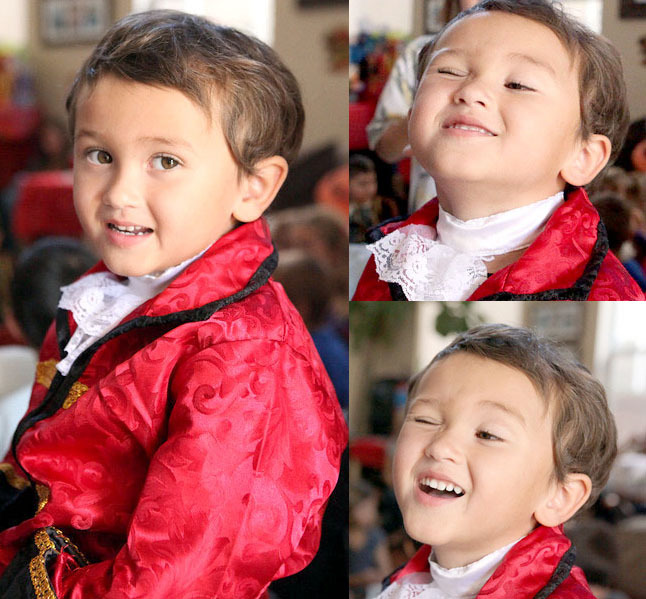 I had a great time….too much fun to measure! 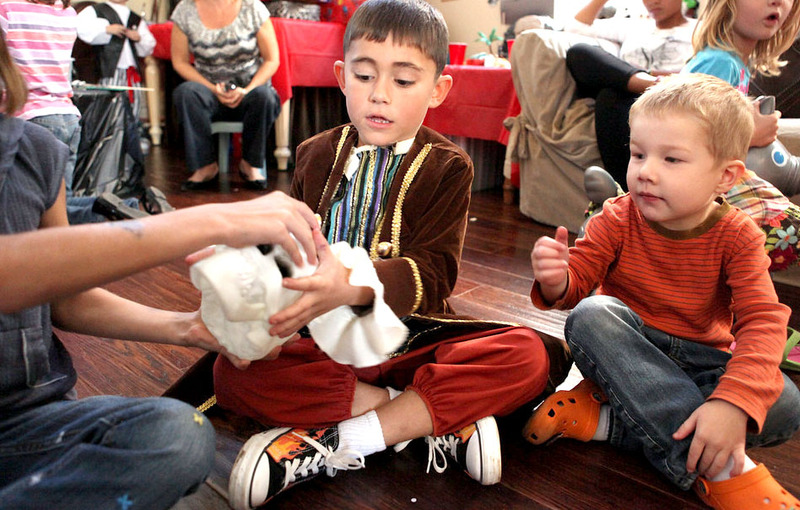 The party wouldn’t have been the same without you. 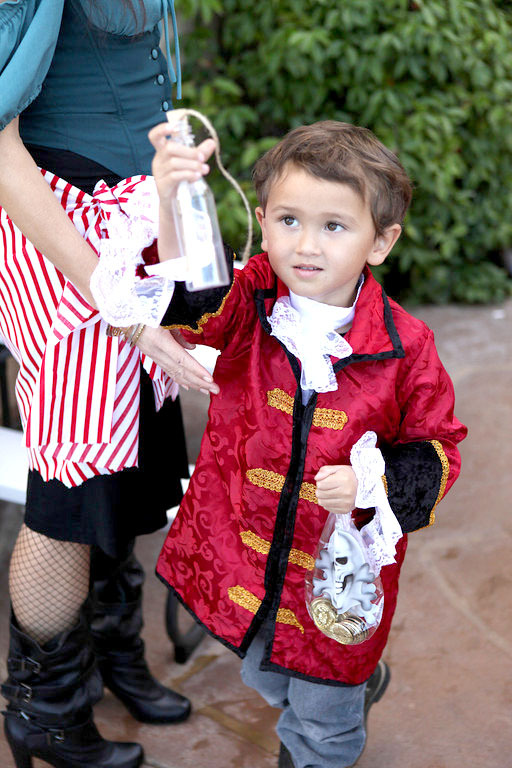 Our neighbor, Jonathan….who was also born on Halloween! 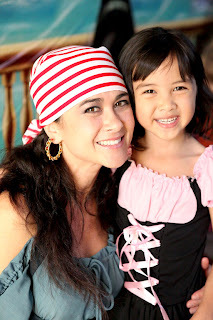 My niece PJ in her cute pink pirate costume. BIG, HUGE THANKS once again to my party Dream Team: Jeff (cakes and food), Allison (food prep and cleanup), Makala (and her friend Kylie) decorations and helping with activities, Julie (photography), Mark (helping with the games), Nana and Papa (decorating, setting up, clean up), Mary and Maylie (invitation assembly and party clean up), Mason (decorating and dressing up as a pirate skeleton)…and especially my husband, Aaron (decorating, fabricating, set up/clean up…and running all the games dressed as one very handsome pirate). 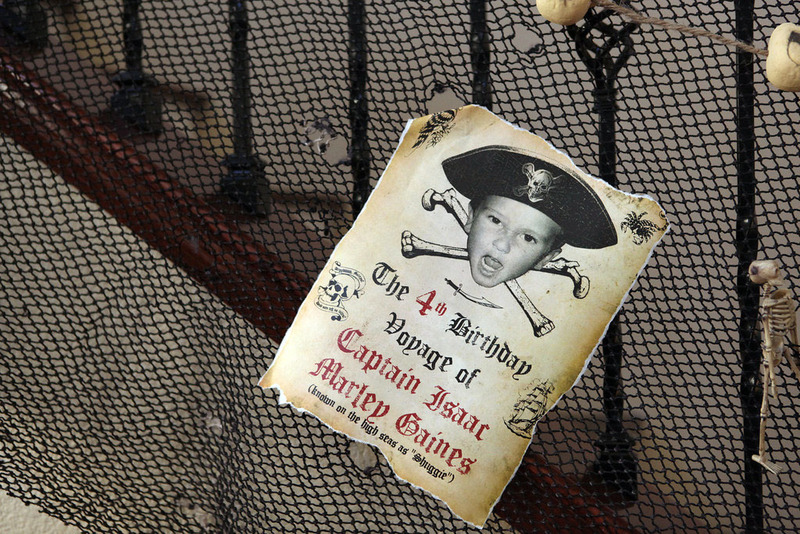 Extremely nice theme for a b'day party. 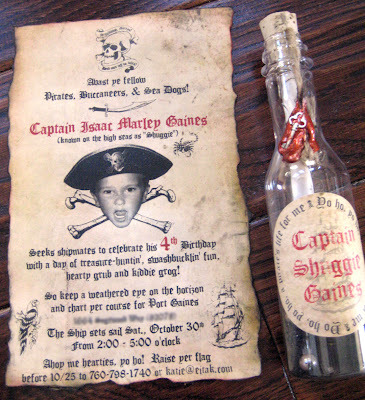 It's quite innovative and I liked the invitations especially. Well, I must say, I am so much reminded of my little sister who got dressed up in a Pirate Costume for a b'day party at her friend's place. My sister is just 8 years old and i must say, she was looking quite adorable. She was wearing something similar to that Pink color dress that has been shown in a pic here. 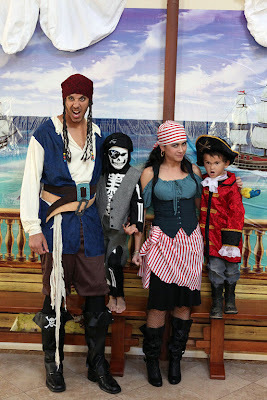 We bought the costume @ Costumes4Less.com They have some really amazing Costumes and i think u all should check it out too!! !